We manufacture our own materials for our own use. Therefore, we are one of only a few companies nationwide of our size that BOTH MANUFACTURE and INSTALL. We offer SINGLE SOURCE responsibility. 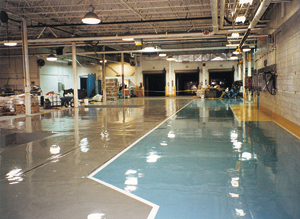 We also install epoxy and urethane systems for no less than twelve (12) nationally recognized manufacturers. Odds are that if you have a Brand Name material in mind, we’re an authorized installer. We do an average of five (5) resinous floors per week (250 annually). Our largest market is automotive and truck service (one-third of our business). We are also very strong in the firehouse “apparatus bay floor” market and the hangar floor market which together account for another third of our business. Last but not least are the industrial and other commercial projects which account for the final third of our work. We’ve done work as far east as Maine and as far west as Atsugi, Japan. We do ALL of the work with our own employees. – No day laborers and NO sub-contractors. We have offices and crews at two (2) locations – New Castle, Delaware and Lakeland, Florida. Our primary geography is east of the Mississippi River. Although, we’ve done more than our share of work in California. Even on the west coast given an “apples to apples” comparison, we would EXPECT to be the best price. Thin film roller applied epoxy and urethane coatings both solvent based and water based. High build squeegee applied 100% solids epoxy coatings installed mathematically to insure a pre-specified thickness. Single and double full aggregate broadcast systems in solid color industrial looks and decorative color quartz. Decorative intermittent and full fill vinyl flake floors. 1/4” hand and power troweled epoxy mortar systems. 1/8” slurry or troweled urethane concrete systems for chemical and/or high temperature environments. Composite floors for heavy vehicle maintenance facilities – a nominal ¼” troweled mortar Resurfacer with an additional 1/16” full broadcast on top.